Since November 2012 pre-1960 historic vehicles have been exempt from the MoT test (UK), a compulsory, annual, check on roadworthiness for all vehicles 3 years old and more. 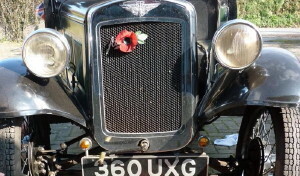 The Dept for Transport exemption was based on the assumption, and trust, that historic vehicles are often very well maintained by their owners and have a much lower accident, and MoT failure, rate than newer vehicles. Owners do have the option to take their car for a voluntary test. Although owners are not required by the 'Vehicle Construction and Use Regulations' to keep a vehicle in a roadworthy condition our Insurance companies do make that requirement a part of the policy. Therefore, it is advisable to carry out suitable, and thorough, checks of your 'Seven', but how many of us really do know what to look for? That your 'Seven' is kept clean and polished does not mean that it is roadworthy. We offer a guide to avoiding a wrong ‘un at MoT time, so that you can ensure that there are no obvious problems if opting for a voluntary MoT. Not everyone has the luxury of a convenient 'Seven' friendly MoT facility, and not everyone gets a pro to do a check-up. However, there is no excuse for not ensuring your 'Seven' is safe and roadworthy. Here are a few things to have a look at. NB: This article is not a definitive guide to the MoT test (UK), or how an MoT Tester undertakes the test. A word here about safety – you will need to get underneath it, and give various parts a bit of a wiggle. 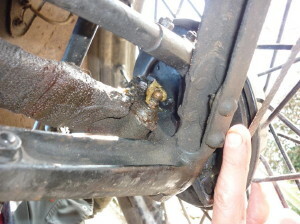 So, make sure you are on good stable axle stands – and never work under a car supported by the jack alone. Be methodical: pick one corner of the car to start at, and work logically right round. 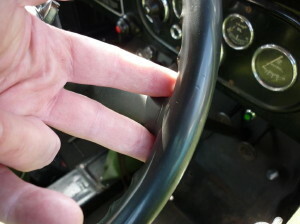 For instance, start at the front nearside and work round. Wheels: Check the spokes are tight and unbroken. A light tap with the handle of a screwdriver should give a nice melodic twang (outer) or ping (inner). If not, get tightening. Rust at the hub is a clue. Oh, and don’t forget the spare wheel. 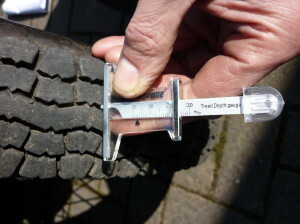 Check the BACK of the tyres for cuts, cracks and damage. 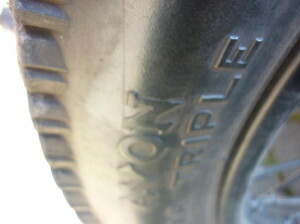 Then have a second look at the outside and the tread. Plenty left, no cracks, nice and even please. 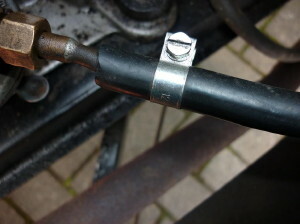 Wheel nuts tight but not barmy, do not use an extension bar on a socket. 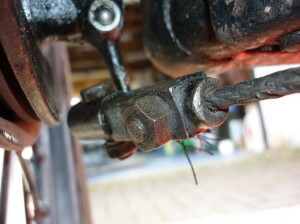 Front axle: check for obvious damage, and check the shock absorber / damper is secure, with plenty left on the friction pads. A quick look at the shackles and bushes is a good idea. 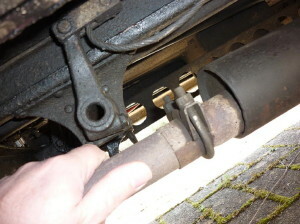 Also check the steering arm on the driver’s side as these have been known to crack at the sharp bend. Clean it off and check carefully. Radius Arms: A notorious place for cracks to start appearing by the rivets. If you can’t check them because of mud and muck, clean it off! 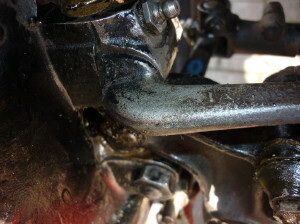 Also check the mounting at the rear end of the radius arms where they fit on the ball on the chassis. No sideways or fore/aft movement at the joint. 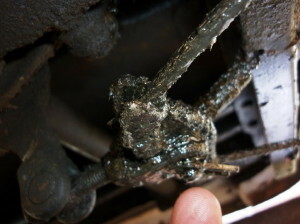 Chassis: Normally, the spare engine oil keeps the chassis nice and rust free, but rot can occur under heavy mud deposits. 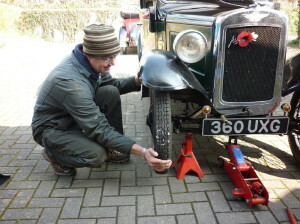 Check the front and rear cross members, especially where they collect the grot thrown up by the tyres, or it gets trapped by the running boards. Flaking, or rotting – get them welded. 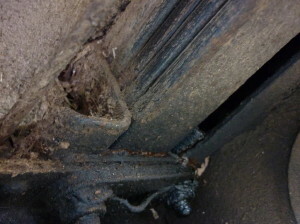 Rear springs: should be free from cracks and well secured to the back of the chassis. Damage or cracks here will need expert attention. Check the spring bushes for snugness. They last for ages provided you keep ‘em greasy. Rear shock absorbers: tend to get ignored. Give them a check. Exhaust: no gaps, holes or decrepit silencers please. Run the engine and check for puffing noise. Fuel tank and pipelines: free from leaks or excessive corrosion. If you use plastic pipe, check for splits and cracks. Hoses should be flexible and not going brittle. Spin each wheel and check that the brakes aren’t binding. Listen for rumbly bearings and dragging on the brake drums. Slight rubbing is OK, but not locking up. Apply a couple of clicks on the handbrake and check that the drag is even. Check that the cables are free and undamaged. Any frayed strands and they should be replaced. Pay attention to the clamp blocks, adjusters and the eyelets at the rear cross member. Check the cross shaft, ensuring that the adjusters have their split pins in place. Rock the wheels by pushing on the top while pulling on the bottom, and vice versa. Make sure that there’s no significant play in either the wheel bearings (all round) or the kingpins (funnily enough, just at the front). A little VERTICAL movement is OK, but indicates time to get shimming. 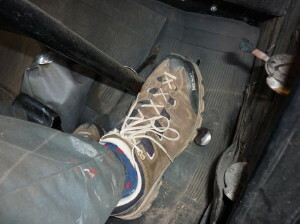 Get a friend to press on the brake pedal while you check all the steering joints and cables for operation. If the hubs twist or the joints flex under braking, there’s some play to be addressed. 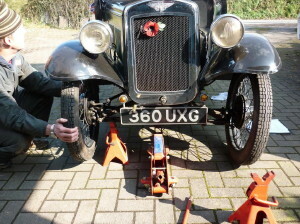 Rearrange the axle stands so that the car is up on one side only. With the opposite front wheel on the ground, gently try to turn the steering by rotating the road wheel as if cornering. This will show up play in the steering axle eyes. 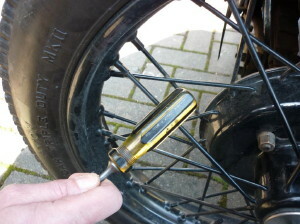 Oh, and REGULARLY check that the king pin cotters are tight. Put both front wheels on the ground. Get a friend to gently rock the steering wheel back and forth, while you look for play in the draglink, (don’t forget that it is spring loaded – you are looking for looseness not just movement) and the steering swivels. 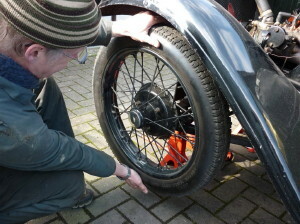 If the wheel moves more than an inch at the rim before the tyres start to squirm, the steering box may need attention. Lights: any light fitted must work, and that includes optional flashing trafficators and rear fog warning lamps. No holes in the red covers at the rear, except to light the number plate. Don’t forget the dashboard lamp and any dip / main pilot light if you have one. Screen: you must have an unobscured forward view – no cracks or big chips in front of the driver. Mirrors: must have at least one rear facing. Wiper must work if fitted. Oh, and beep the horn. Time to go out for a little test drive. Find a nice quiet flat road, somewhere you won’t attract an audience. A spotter is handy to check that there’s no one about to get a fright from your antics. At a gentle pace, (20mph is plenty), apply a little helm to the steering wheel and check that the car responds in a predictable manner. Sniffing the hedges like an excited puppy is not a good thing. Apply a little brake with just a gentle hand on the wheel, and ensure that the car doesn't veer to the side under braking. Violent swerves mean that at least one brake needs attention. NOT OPTIONAL! Brake test: When its time to anchor up, the brakes have to reach a minimum effectiveness. 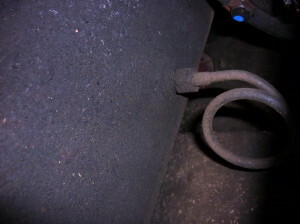 For coupled brakes, Footbrake: must reach 50% (0.5g) Handbrake: must reach 25% (0.25g). Early uncoupled Chummys 25% each. 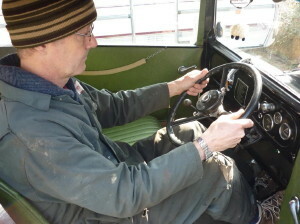 The use of a Tapley brake force meter is preferable. 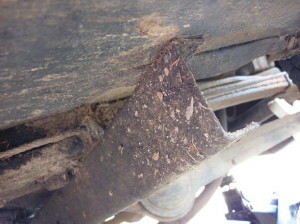 However, an old tip is to use a standard housebrick on its long edge in the footwell, placed across the car. If it falls over onto its frog face when you brake, firmly but without snatching, you would have passed the Tapley brake test level of 50% . Take a walk around the car. It mustn’t have any split seams or sharp edges to catch a pedestrian. If it looks too rough, it IS too rough! This article, written by Geoff Hardman and Mike Davies, originally appeared in CA7C Seven Focus in April 2015 p11-16. 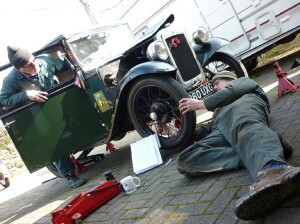 NB: Should any of the above checks reveal a problem then please look at that topic under Austin Seven Journal at the technical sheets issued by the Austin Motor Co. Ltd.; Technical Articles, written by our members; and Technical Advice, articles from early motoring magazines. IF in doubt seek professional help.